Gorgeous 14k yellow gold Flat bracelet. This design measures 15.8mm in width is hinged and features a box with tongue and safety style clasp. 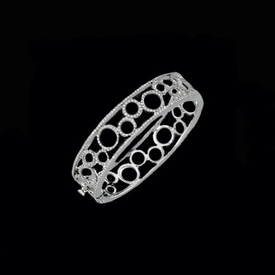 This incredible Italian made bracelet makes a statement. This bracelet weighs about 36grams and will fit a 7 inch wrist. Captivating 14k yellow gold diamond cut fancy hinged bangle bracelet. Bangle measures 6.5mm wide by 7 inches in diameter. A great design for any time wear. Bracelet weight about 6.70grams and features a hammered polish finish. Bracelet is hollow. 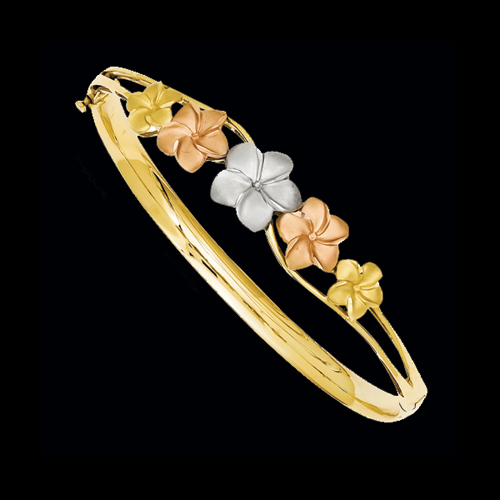 Beautiful 14k tri color gold plumeria design bangle bracelet. This incredible bracelet is hinged and measures 7 inches. Stylish design perfect for casual or elegant wear. This bangle bracelet weighs 10.08grams. Finely crafted 14kt gold filigree design cuff bracelet. You'll love this incredible design, it transcends time yet and is unique enough that you'll be the only one wearing it. 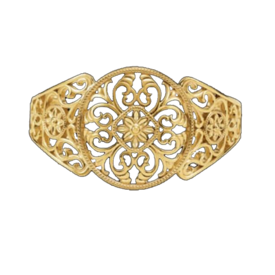 Our filigree cuff measures 35.5 across at the center medallion and weighs a fabulous 40.32grams. 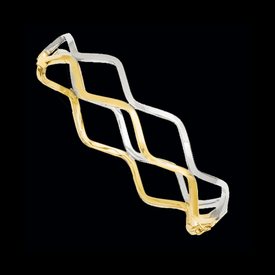 Order this incredible cuff bracelet in 14k yellow or white gold. Beautiful 14k yellow gold fancy swirled design hinged bangle bracelet. 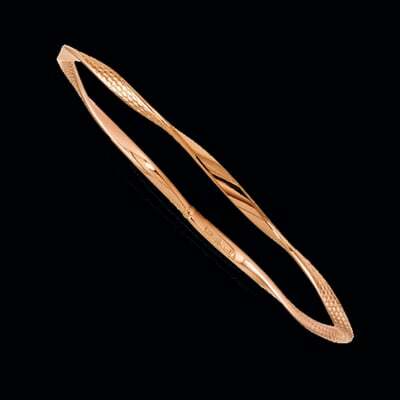 This gold bangle bracelet measures 5.50mm wide and is available in a 7 inch and larger 8 inch selection. You'll love the dazzling swirl design of this bracelet. The 7 inch selection weighs aprox. 9.03grams. Stylish 14k gold twisted hinged bangle bracelet. Bangle measures 4mm in width and 7 inches in length. An Italian made bangle, features a hinged fold over catch design with a safety clasp. Bracelet weighs about 4.25grams. Part of our Lifetime Guaranteed collection. If this bracelet breaks or is damaged for ANY reason simply send it back and we'll replace it PERIOD!!! If the item is no longer available we will replace with similar same value item. How can you beat that? A beautiful bracelet, guaranteed for life. Beautiful 18Kt yellow gold Diamond Horse cuff bracelet. 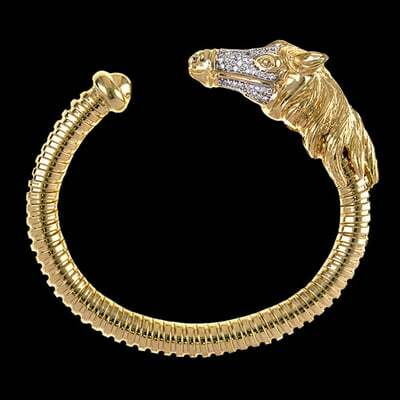 This unique bracelet features a horse head end set with .61ctw diamonds and a flowing mane. A wonderful bracelet for that next equestrian event. Stunning 14k yellow or white gold cuff bracelet. You'll love this incredible design, it transcends time yet is unique enough that you'll be the only one wearing it. 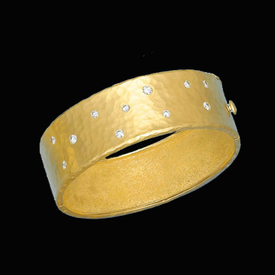 Our gold cuff bracelet features a hammered finish and measures 19mm wide. 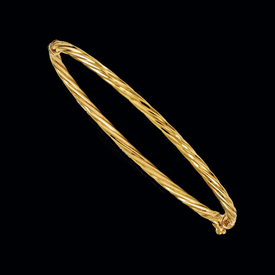 Delightful 14k yellow gold graduated weaved design bangle bracelet. Flashy design features a fancy weave that measures 12.5mm across the top then graduates down to 6.25mm at the back. An open back and diamond cut design gives this bangle a style of its own. Bracelet measures 7 inches and weighs about 12.16grams. Lovely 14k two tone gold fancy hinged bangle bracelet. This design measures 3mm wide and at the bypass point, 10mm across. 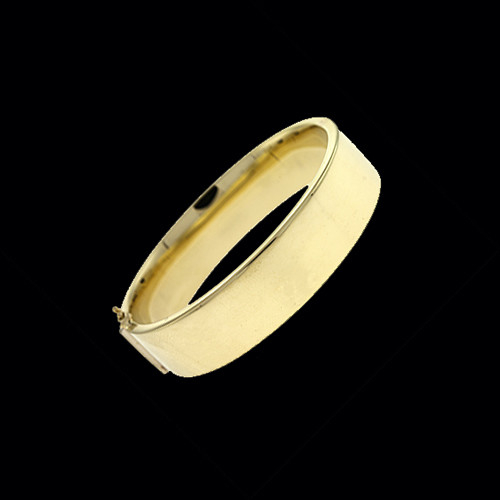 Hinged bangle is an Italian created piece and weighs about 6.34grams. Shimmering 14k yellow gold twisted bangle bracelet. This bangle measures 3mm wide by 7 inches and weighs about 3.9grams. You'll love this classic bangle style. Pretty 14k Rose, Yellow, or White gold textured design bangle bracelet. Our textured and polish bangle measures 3mm wide and available in 3 14k gold choices. Bangle is a slip on style and measures 7 inches. Textured polished finish. Great bangle, mix, match, and stack. 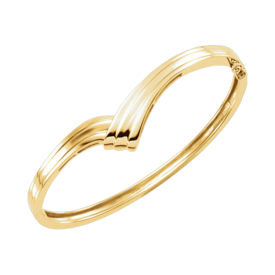 Stunning 14k yellow gold flat design bangle bracelet. 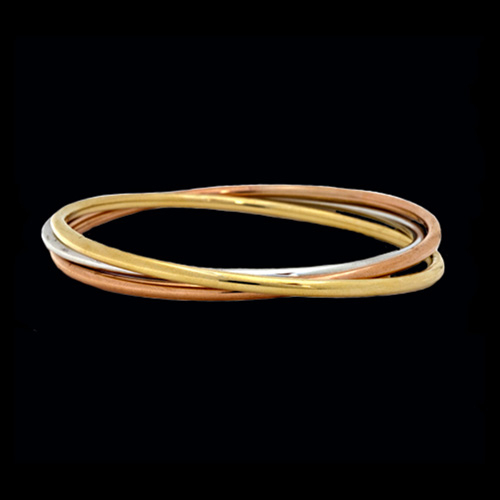 This bangle measures 6.3mm in width by 6 1/2 inches oval. Beautiful simple design is hinged and weighs about 26.79grams. Features include a safety clasp, hinged design, and polished finish. Bracelet has an open back. Spoil yourself with our finely crafted bangle bracelet. Stunning 14k yellow gold flat design bangle bracelet. 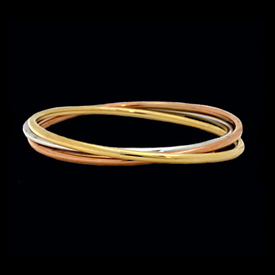 This bangle measures 7.4mm in width by 6 1/2 inches oval. Beautiful simple design is hinged and weighs about 51.4grams. Spoil yourself with our finely crafted bangle bracelet. Classic design 14k Tri color gold bangle bracelet. Each bracelet in this design measures 2.9mm wide by 7 inches. 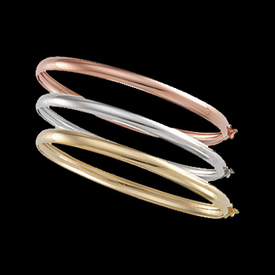 A wonderful bangle set that will compliment your wardrobe. This bangle bracelet is a slip on design. 14k White gold Diamond Journey bangle bracelet. This bangle is set with 1/4ct tw diamonds are weighs 22.80grams. Special order in 14k Yellow gold. Classic design 14k Yellow or White gold bangle bracelet. 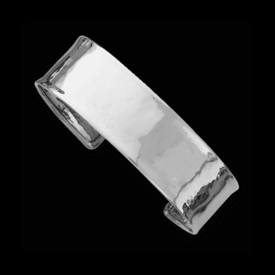 Hinged bangle measures 4.75mm wide and weighs 4.90 grams. A very simple, timeless design bangle. 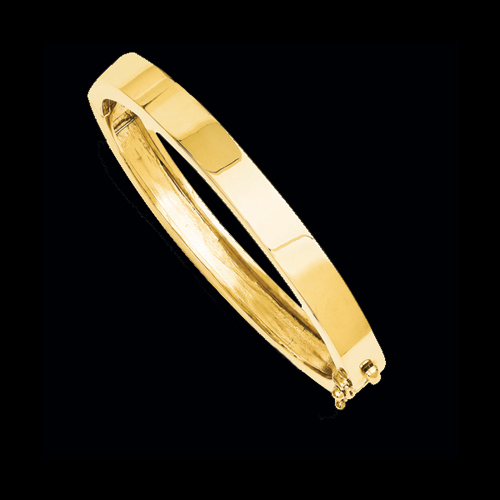 Pretty 14k Yellow gold hinged bangle bracelet. 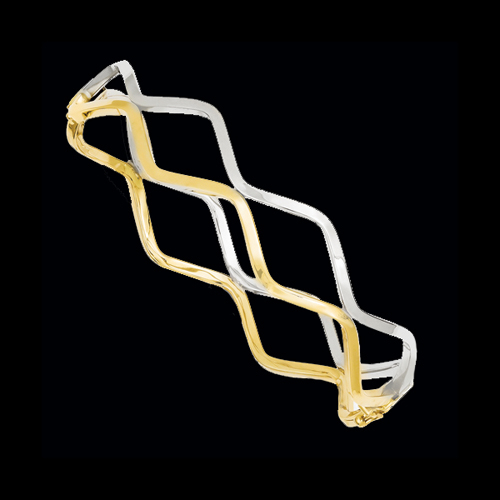 This gold bangle bracelet features a timeless design and is available in 14k white gold by custom order. 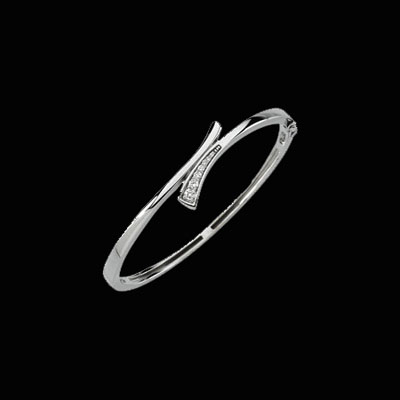 In 14k white gold this bangle will take an additional 15 business days before it ships. This bracelet weighs 13.59grams. 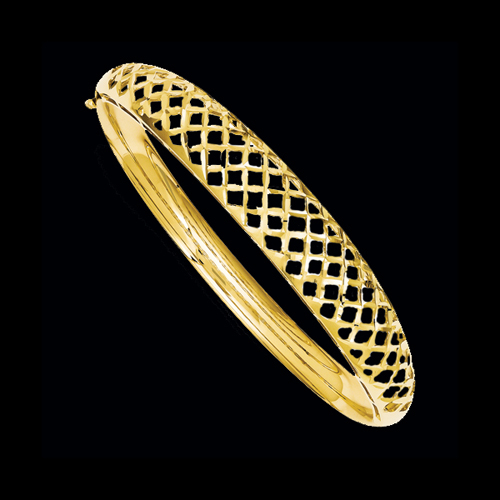 18K Yellow gold diamond bangle bracelet. Diamonds total .66ctw and are VS 2 - SI 1 clarity, G-H color. This great style measures 22mm wide and is also available in a 40.5mm, email for pricing. This bracelet is SOLID gold.